1 How long is bear spray good for? 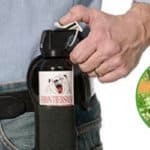 2 Why does bear spray expire? 3 What happens to expired bear spray? 4 Can bear spray expire sooner than its expiration date? 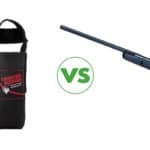 5 How to test your bear spray’s effectiveness? How long is bear spray good for? Most bear spray canisters will carry an expiration date label stamped on them, typically their shelf life is 3-4 years. These expiration dates don’t have anything to do with the degradation of the effectiveness of the capsaicinoids used as the active ingredients in the spray, rather, they describe the time after which the product begins to lose its ability to spray well. Why does bear spray expire? In order to understand the reason behind bear deterrent’s deterioration over time, you must first understand the construction of a typical canister of the product. It consists of three basic components – the active ingredient i.e. capsaicinoids, a carrier e.g. propylene glycol, and a propellant e.g. nitrogen. The active ingredient is suspended into a base of oil or water by means of the carrier, and the propellant pressurizes the canister so the suspension gets released when the trigger gets pressed. Normally, the propellant releases the solution in the form of fog into the air. With the passage of time, even as the canister remains unused, its pressure begins to reduce – and while the active ingredient remains intact – the product loses its effectiveness. This holds true for nearly all aerosol based spray products like body spray or hair spray. The core ingredients will be unchanged past the expiry date, however, the propellant will start to deplete, which will in turn compromise the canister’s ability to cover its quoted range; hence, the product is deemed expired. What happens to expired bear spray? Put simply, it won’t spray as effectively as before. Does expired bear spray still work? For a while, absolutely, but it won’t cover the same range as it was intended to, and with the passage of time, it will only get worse. The smaller the canister, the more pronounced will be the reduction in performance. Since the distance the spray covers is essential for a successful defense against a charging bear, it is generally a bad idea to carry around a canister that is past its expiration. Naturally, if you don’t have access to a fresh can and must go into the woods regardless, carrying the expired can won’t hurt your chances! Can bear spray expire sooner than its expiration date? 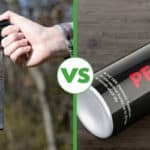 If you’ve used a bear repellent canister on one outdoor hike considerably (but not fully emptied it yet), it’s better to replace it with a new one for the next trip, since using it may have accelerated the deterioration of the seal holding the aerosol propellant inside the canister, which, could have compromised its spray range. The same applies for spray canisters that have been left in temperature extremes (below freezing point or above 50 degrees Celsius). 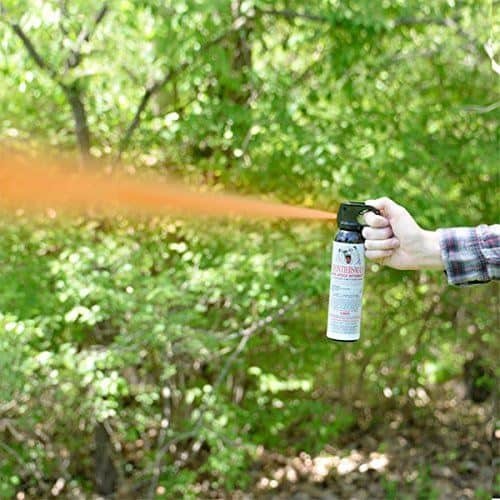 How to test your bear spray’s effectiveness? If you purchased a full can of bear deterrent some months ago and aren’t sure if it’s effective anymore (perhaps because it got left out in a blizzard and so on), you can test its effectiveness outdoors on a non-windy day. Check for any stray breeze and make sure you stand upwind because you don’t want even a whiff of it to get near you. Press the trigger for a fraction of a second and see how far the spray goes – if it is within the quoted range of the product, you’re all set. Of course, you must realize that the test itself will consume a portion of the canister – depending on the ounces/second the product is capable of delivering, this could be a small to moderate amount of bear spray! Here’s a brief clip of how to properly test a deterrent canister’s condition. 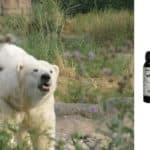 You’ll understand now that every bear deterrent product will expire eventually, but In order to ensure that its demise doesn’t come before its use by date, you should avoid storing it in places where it could be exposed to extreme temperatures. These include the inside of a car, a cabinet outside your house, direct sunlight etc. Ideally, you should keep the canister at room temperature at all times. Furthermore, while transporting bear spray, ensure that it is secured properly and has no chance of falling out. Lastly, with commercial products always having a slim chance of unreliability, it is a smart idea to carry at least two canisters with you on a trip, as a contingency, in case one can fails to fire for whatever reason. The Counter Assault Bear Deterrent is a great choice of bear spray, in terms of effectiveness and reliability. If you’re still not sure about something, feel free to comment any queries below. can th cans be repressurized with nitrogen?